63 pp, 8.5" x 8.5"
Growing up in Austin TX taught me the dramatic differences between flat land (the Texas central prairies to our east, where my family rarely ventured) and lands of glorious ups and downs (the Texas hill country in and to the west of Austin). Thus, even though I spent my later childhood and adolescence in lush, green central Michigan, the dry, rocky Texas hills stayed in my mind. When in 1965, still in Michigan, I met the person who would become my "mountain man," we chose Tucson AZ – with mountains in all directions – as our best choice for his first teaching job and our first home. 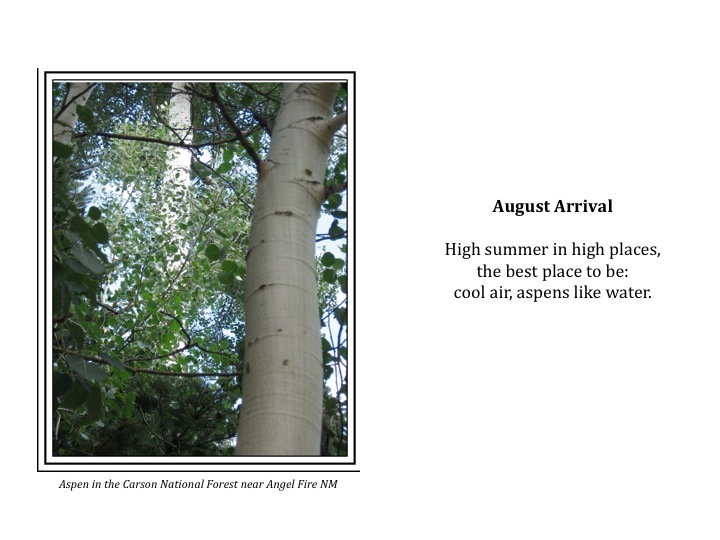 The inaugural book in my photo-haiku series, Sonora Spring Haiku (2013), reflects some of the wonders we saw in Arizona. After Tucson we moved to Denver briefly, and fell in love with the Colorado Rockies. Although grad school and jobs conspired to send us elsewhere – to St. Louis, Oklahoma, and most recently to East Texas (Year of Haiku, 2013; and Pineywoods Summer Haiku and LaNana Creek Haiku, both 2014) – our hearts have remained in the mountain west. So for the past several years we have spent a month or so every late summer in the Rockies of northern New Mexico and southern Colorado. The photos and poems in this book represent our experiences there: in the Sangre de Cristos outside Santa Fe NM; the Moreno Valley's high cool park near Wheeler Peak east of Taos; and the gorgeous country around Gunnison and Crested Butte CO.
Fall is our favorite season in the mountains. The Rockies are staggering year-round, but in autumn, they are in their full glory. Through all the transformations – from the delicious greens of "high-cool high summer," to the time when entire mountainsides of aspens turn gold, and then the gradual leaning toward winter – the peaks, valleys, and high parks of the Rockies are incomparable. This book is a small tribute to that grand beauty.